Top slammer, thinker, and sanctuary-maker Crystal Valentine. Photo is courtesy Werds of Art via crystalvalentine.com. Born and raised in the Bronx, Crystal Valentine is a writer, activist and educator. She earned a B.A in psychology at NYU, where she is returning as a MFA candidate in Poetry. Crystal is a Callaloo fellow, the two-time winner of the College Unions Poetry Slam Invitational, the 2015 NYC Youth Poet Laureate, and the 9th ranked woman poet in the world by way of the 2016 Woman of the World Poetry Slam. 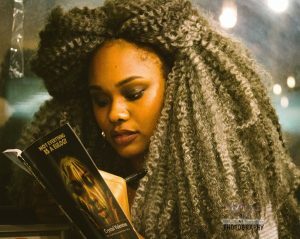 She recently placed 2nd at the 2017 National Poetry Slam festival with the Brooklyn poetry slam team. Crystal’s work has been featured on programming for MSNBC, Blavity ,The Huffington Post, BET and more. She was Glamour Magazine’s 2016 College Woman of the Year, Teen Vogue’s “Rising Young Black Thought Leaders And Trailblazers,” and is the author of her first book, Not Everything is a Eulogy. When she isn’t performing, Crystal can be found leading youth workshops at Harlem Children’s Zone and Urban Word NYC. Ultimately, she aims to make her poetry a sanctuary for all identities of the African Diaspora. She uses her platform to spread joy and self-love by advocating for her community, and documenting and humanizing their lived experiences as people of color in America. Visit her at crystalvalentine.com.